Hone Manahi Power was a son of James and Fanny Power who lived at Aohanga (now Owahanga) on the coast north of Mataikona. He was born in 1893 according to army records, but does not appear in birth indexes. 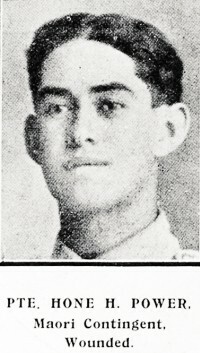 One of his brothers, William Edwin (Wiremu Eruini), also served in World War One. Hone worked as a shepherd for Harry Hume at Aohanga when he joined the army in October 1914 (service number 16/198). He and Wiremu were among the first Wairarapa men to join the Maori Contingent. They trained at Avondale Racecourse in Auckland before leaving for Egypt in February 1915. The contingent of 500 was sent as garrison troops to Malta. With heavy casualties to replace at Gallipoli, the Maori Contingent landed at Anzac Cove on 3 July 1915. It was a pioneer unit, digging trenches and making roads. They also took part in digging the Great Sap, a deep, wide trench north of Anzac Cove, made for the coming August offensive. Hone was wounded on 21 August, probably at Hill 60, where 100 of the contingent were fighting with the Mounted Rifles Brigade. He was hit in the shoulder and taken to a hospital on Lemnos. After five weeks he went back to Gallipoli where he served with the Otago Infantry, the Maori Contingent having been disbanded owing to casualties and sickness. He evacuated from Gallipoli in December 1915, returning to Egypt where he caught mumps in February 1916. With the N.Z. Division he travelled to France in April 1916, as part of the N.Z. Pioneer Battalion. He was wounded in the arm on 14 September during the Battle of the Somme. A few days later he was in England at the N.Z. Hospital at Brockenhurst, where he spent a month before going to the convalescent hospital at Hornchurch. After recovering he went to Codford and Sling camps for retraining, returning to the Western Front in July 1917. In September he was sick with jaundice, spending three weeks in hospital. Hone returned to his battalion just after the Battle of Passchendaele and was killed in action on 7 December 1917, probably in the Polygon Wood-Polderhoek area of the Ypres Salient. Hone is buried in the Birr Cross Roads Cemetery, near the village of Zillebeke.